I am back with one more interesting post for my blogger friends and readers . 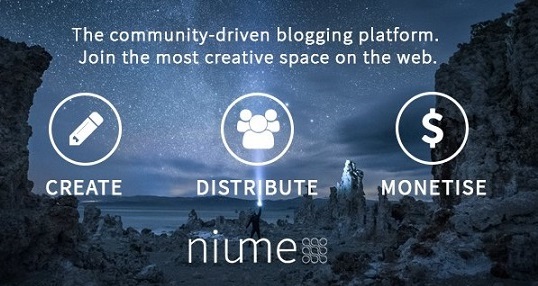 Today’s Post is about monetizing a blog with a collaborative blogging platform called Niume.com . Niume.com is a website or a platform where bloggers can register and share their posts and Get Paid for getting their posts viewed and also one can increase their reader base via Niume.com . It pays 1$ for 1000 views and also there is one referral program through which members can earn money . 1.One does not need to wait for six months or 50 posts as in case of Adsense to apply for it,one can start earning the moment one start posting contents . 2. One needs to have a minimum threshold of 10$ to apply for a bank transfer , which is very less as compared to Adsense where one needs to have minimum 100$ to request for a bank transfer . 3.They have wide range of categories , so blogger from any niche can try . 4.If one is active there , means one is able to post good number of contents there one can easily earn good money from there . 5. One can also increase their blog traffic with this Niume.com . Creating an account there is very simple . once account is created one can start posting their contents , their own blog posts , Video’s etc , If one is posting content from other ‘s blog or website , Credit should be given to original source . One can check their Dashboard to check their Views & Hypes , check their Niume Wallet etc. One can add links to their social media sites and blog in their profile , so that one can easily connect with bloggers of same niche . Since it’s not an Indian website the first question that came to my mind is how will I get my money . Once our earning reaches 10$ we can request for a bank transfer , for that we need a Paypal account (an account to get foreign payments ). I had read a lot about this Paypal account but since I never needed one , I was not having one . It’s very easy , one just needs to have an email account , Pan Card and a bank account number . So I found this platform a very good way to increase my blog traffic and earn some money. Every thing is so simple and transparent . One can easily reach that 1000 clicks if one is active there . One can also ask their friends and followers to register via their link and for each successful referral one gets some points . Then one can increase their earning by posting good contents which gets more hits and likes and also by referring their friends on social media . One more thing I would like to mention is this is not only for bloggers but Youtubers or any one can register and start posting some good and meaningful content there which others would like to read , so if one is not a blogger and still want to join this site , can go ahead and register there . Hope you all enjoyed reading this post and found it useful , if any doubt can ask me in comment sections below .